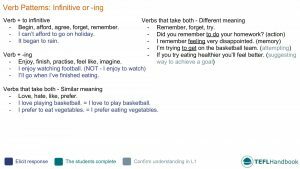 This ESL lesson plan contains activities and games for teaching some common verb patterns to intermediate level students. Use these teaching ideas as a stand-alone lesson plan, or to supplement an existing one. If you use an iOS or Android device, don't forget that you can get offline access to these materials, along with a much more extensive selection of ESL lesson plans, through the TEFL Handbook app. Discuss each group of verbs with respect to verb patterns, providing examples of some common verbs that fall into these categories. When they have finished, they can compare their answers with a partner. Start by telling your students to make six sentences about their life using the verb patterns they have learned today. Three should be true and three false. When they have finished, students should swap books with a partner who must mark each one T or F depending on whether they think they are true or not. Finally, they'll return each other's books, correct them and give their partner a score out of 6. Follow up with a discussion at the end. You’ll need dice or a dice app on your phone. Start by dividing the class into two teams. On the board, make two lists of 6 verbs and number them. In each round, you'll roll the dice twice mark the selected verbs on the board. In groups, the students must now come up with a funny sentence that uses both verbs correctly. If you want to make it a little more challenging, you can limit them to a particular tense. Below are sample lists that you could use. Write these on the board side by side. Give one point for a grammatically correct sentence and a bonus point to the team with the funniest statement. Set a time limit based on the ability of the class. 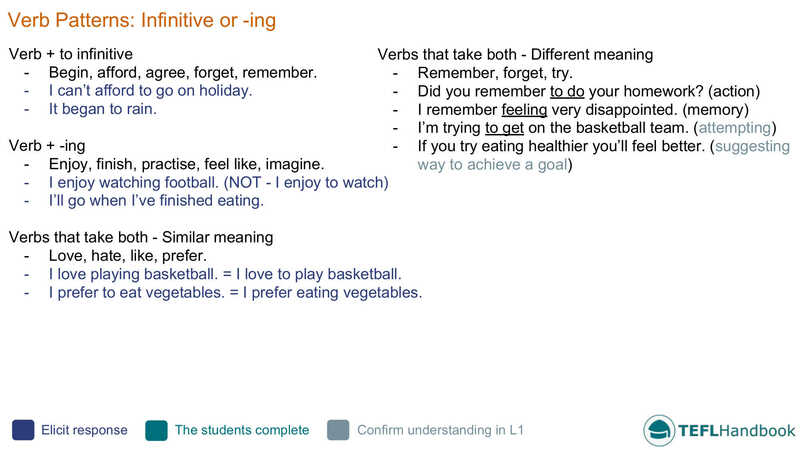 Our suggested next free lesson in this course is on comparative and superlative adjectives. If you've found these materials useful, be sure to check out our full list of intermediate ESL lesson plans. For other levels, have a look at our complete selection of EFL - ESL lesson plans. Also, if you use an iOS or Android device, try out the TEFL Handbook app. An ESL lesson planner for English teachers. It has a lot more content and gives you faster access to our ESL resources, making it easier to use in class.